While astute readers will note that spiders are not technically insects, in recent years the SPCI has actively pursued an inclusive and non-discriminatory policy towards other invertebrates and Minority Species. Inspectors were shocked by the conditions in which the creature had been kept. The terrified spider was discovered by a member of the public, who courageously alerted the SPCI to the plight of the poor creature. A team of three SPCI Inspectors was immediately dispatched to the scene. "It was dreadful," said SPCI Inspector Frank Morris, "She was dehydrated and running around like a mad thing. She must have been trapped in there for hours." "I don't see why it matters," said Mr. Smith when interviewed by SPCI Inspectors, "It's only a f***ing spider for Christ's sake!" Police were called to the scene and shown photographic evidence of the abuse, but advised the SPCI that no action could be taken in this case as the spider in question had not signed a tenancy agreement with the householder. 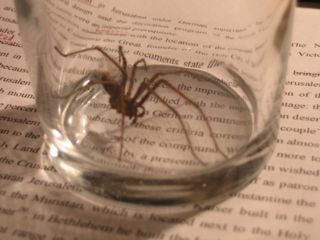 House spiders are not currently protected by UK law. When pressed on the issue, PC S Staines replied, "Look, I've had enough of you lot and your bloody jokes. Now sod off the lot of you or I'll charge you with wasting police time."